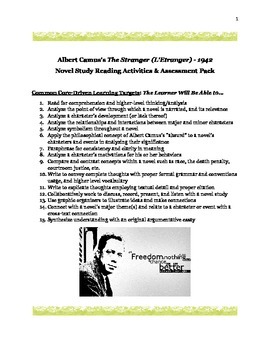 Camus & The Stranger: Common Core Critical Thinking Activities/Assessments Pack! 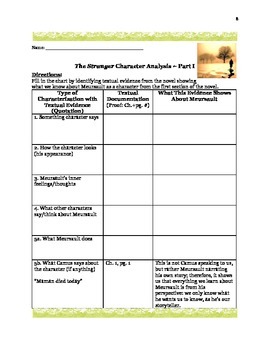 These activities will help stimulate not only student in-depth comprehension and higher-level analysis of this incredible yet compact novel, but it will also invite further class discussions and application. In this way, you'll help students develop critical thinking and synthesis skills. 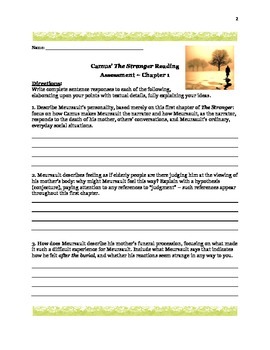 You may choose to use the reading assessments as formative assessment pieces, and the final essay as a summative assessment; regardless, you'll be inviting students to work within the higher levels of Bloom's Taxonomy, including applying, analyzing, evaluating, and synthesizing. You're also helping students develop the Common Core 21st Century skills of problem-solving, communication, collaborating, and critical thinking as they develop the anchor standards for reading, writing, speaking/listening, and language. 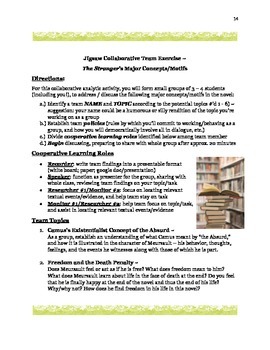 Enjoy, and please leave me feedback as to not only how you use this activity pack in either your Philosophy or ELA course. You may wish to pair this with my pre-reading The Stranger research activity, also available in my store. Thank you for looking!